Brittanie and Adrian Doaks and their 2-year-old son, Kingston, sat in front of a computer in their hometown of Jackson, Tennessee, for a videoconference that connected them with a pediatric psychologist and autism specialist two hours away in Nashville. They were hoping for answers. Kingston, extremely active from 9 months old, was advanced physically, but his verbal abilities lagged. At age 2, he had only three words in his vocabulary — momma, daddy and ball. Initially, he was diagnosed with a speech delay, but there were other concerns as well. He had difficulty sleeping, and engaging with his peers was a challenge for him. While he showed great affection toward his parents, siblings and grandmother, he was often socially withdrawn and would become very agitated around strangers. The Doakses decided to pursue an autism evaluation for their son. Following the screening, Kingston, who has since turned 3, was diagnosed with autism spectrum disorder (ASD). ASD is an umbrella term that encompasses several different neurodevelopmental disorders. According to the U.S. Centers for Disease Control and Prevention (CDC), ASD impacts one in 68 children. Currently, in many parts of Tennessee, there are not enough local providers to conduct autism evaluations and diagnoses for young children. As is often the case, the Doaks family was referred to the Vanderbilt Kennedy Center’s Treatment and Research Institute for Autism Spectrum Disorders (TRIAD). For more than two decades, TRIAD professionals have had a close partnership with the Department of Pediatrics and the Division of Developmental Medicine at Monroe Carell Jr. Children’s Hospital at Vanderbilt and have been providing evaluations for families when there are early concerns for autism. Over that same interval, the demand for such evaluations has increased dramatically as community and provider knowledge about autism has expanded. Yet, in many parts of the country, the demand for services is so great that families often wait more than six to 12 months for an evaluation by specialists. To meet this tremendous need in Tennessee, the Vanderbilt Kennedy Center (VKC) and Children’s Hospital have been building their capacity in communities throughout the region and creating outreach services to ensure that children receive evaluations, an autism diagnosis if appropriate and services in a timely manner. “When early intervention is the key, can you imagine what it must be like to be told to wait months or a year for answers and help?” said Zachary Warren, PhD, associate professor of Pediatrics, Psychiatry and Behavioral Sciences and Special Education and executive director of TRIAD. Telehealth initiatives, which use telecommunications technologies to support long-distance clinical healthcare and health-related education, are part of that beyond-the-walls strategy. Additionally, TRIAD is providing training for educators in schools and equipping local organizations with the tools to better meet the needs of these children and families. “With the prevalence of autism on the rise, the need for early identification and treatment of young children with ASD represents a pressing public health and clinical care challenge,” Warren said. The Doaks family is one of 70 families who have worked with TRIAD via telehealth since the inception of this program in 2016. Their journey began around his first birthday, when Kingston had only said “momma,” causing concern for Brittanie and her husband, Adrian, who both work in the education field. The couple expressed concerns about their son’s development to his pediatrician, who initially thought that Kingston’s history of ear infections could have caused some hearing impairment. Kingston got ear tubes to help with his infections and also started speech therapy. But still his vocabulary remained limited, and he began working with Tennessee’s Early Intervention System (TEIS), a voluntary educational program for families with children through age 2 with disabilities or developmental delays. Through working with TEIS, the Doakses were told that if autism was suspected, they needed to pursue an evaluation as soon as possible. Instead of driving two hours from their home for an on-site evaluation in Nashville, the Doakses were able to go to Children’s Hospital’s specialty clinic at Ayers Children’s Medical Center in Jackson, Tennessee. Ayers Children’s is part of the Vanderbilt Health Affiliated Network, a physician-led network of doctors, regional health systems and other healthcare providers focused on improving the health of communities in the region. They met in the Jackson clinic with Mary Fleck, MEd, BCBA, a TRIAD educational consultant based in the area, and an autism specialist based at Vanderbilt joined them remotely for Kingston’s evaluation. Pediatrics in the Division of Developmental Medicine, is able to perform an evaluation for autism through videoconference with a patient in another city. Photo by John Russell. Jeffrey Hine, PhD, BCBA, assistant professor of Pediatrics in the Division of Developmental Medicine and one of TRIAD’s licensed psychologists who oversees these telehealth autism evaluations, was on the other end of the camera. He and a local team member from TRIAD led Kingston through a standardized play assessment — the STAT — the Screening Tool for Autism in Toddlers and Young Children — which is an interactive measure developed to screen for autism in children between 24 and 36 months of age. The assessment involved a series of structured play tests geared explicitly for young children. By playing with things like bubbles and balloons and offering them snacks, clinicians are able to critically evaluate key social communication and play skills that are often areas of concern for young children with autism. At the end of the screening, the Doaks family received answers from a Vanderbilt expert and an action plan for getting Kingston the help he needs. TRIAD researchers have documented that this rapid action tele-assessment has helped 85 percent of families get definitive information without having to wait or travel to Vanderbilt. This same research has documented a high level of accuracy of this assessment, with over 75 percent of cases of ASD accurately identified via telehealth. Following Kingston’s diagnosis, Fleck conducted in-home training and support for the Doaks family once a week for six weeks. She also connected them with educational resources and autism peer groups in order to help Brittanie and Adrian navigate their son’s new diagnosis. “Mary has been so sweet and willing to help, and having a person like her, especially so soon after the diagnosis, was very comforting,” Brittanie said. 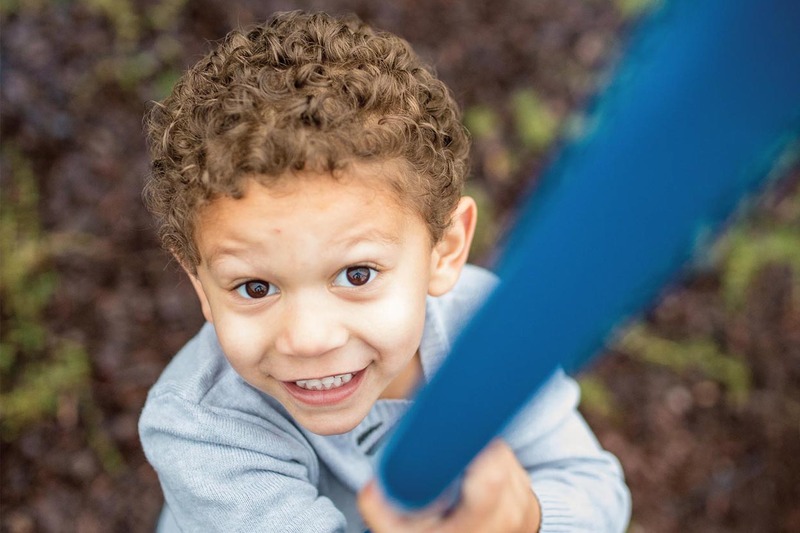 Acquiring an early diagnosis before age 3 enabled Kingston to start public preschool in August and made him eligible for speech therapy and occupational therapy through state programming. Adrian and Brittanie Doaks with their 3-year-old son, Kingston. Photo by John Russell. Brittanie says her son has made great strides in the time since his diagnosis. He went from saying only three words at age 2 to being conversational a year later, and he demonstrates a higher level of comfort in social situations. He also loves running, swimming, playing outside and reading books. The Doaks family has also participated in TRIAD’s Families First Program, which offers free workshops at the Vanderbilt Kennedy Center and via livestream to caregivers of young children newly diagnosed with autism. The primary goal of Families First is to equip caregivers with practical tools to support their child, provide resources to more easily apply strategy and planning ideas, and give caregivers an opportunity to meet others with similar questions or concerns. For caregivers outside the Nashville area, Families First workshops can be attended via videoconference technology in Jackson and Chattanooga, Tennessee, and at sites in Alabama, Georgia, Texas and New Mexico. Following the videoconference sessions, TRIAD consultants are on hand at these sites to provide coaching and feedback to caregivers. Beyond autism evaluations, diagnosis and treatment, TRIAD is working to ensure continuity of services for children with autism and their families by offering extensive training in school systems throughout Tennessee. Through a five-year, $10 million training grant from the Tennessee Department of Education (TDOE), TRIAD and TDOE provide education and training opportunities for school personnel throughout the state. This TDOE support and 17-year partnership allows TRIAD to provide services to educators serving kindergarten through high school at no direct cost to those educators, their schools or school systems. Further, it allows TRIAD to dramatically increase the number of educational opportunities available to educators. Through this grant, TRIAD delivers approximately 100 professional development and training opportunities annually to educators through statewide workshops, trainings and partnerships as well as online education. In addition to school training, TRIAD works with numerous community organizations in the Nashville area to better equip them to serve children with disabilities and their families. TRIAD consultants train staff within these cultural destinations to promote full inclusion of all children and adults and help them develop research-based supports to increase accessibility, such as hosting inclusive or modified performances or activities. Participating organizations include the Nashville Zoo, the Nashville Ballet, the Nashville Opera, Cheekwood, the Frist Center for the Visual Arts and more.